It's mildly fascinating to me. How do you *do* that? Emulate the joker? Its so common in the states to smile that way that to not do so seems off. "Hi, where do you keep the widgets?" Without stopping after saying "Hi" for an acknowledgement or return greeting. It abbreviates the greeting to the point of something you can do without the acknowledgement or cooperation of the other party, which is to say it completely undermines its purpose. server: "Hello, welcome to our establishment! My name is Michael, and I'll be your server today!" Customer: "Yes, we'll have the green eggs and ham..."
Which I've been told is considered astonishingly rude in other cultures. Well, for the sake of brevity I don't say hello to a grocery store employee I interrupt restocking just to ask where the chips are located. Another thing is proper goodbyes, including in written conversations or conversations over the phone - though it appears that Americans omitting the latter is a trope fuelled by Hollywood. Germans will usually enter a sort of 'singsong' before saying their goodbyes, to indicate that they'd like to end the conversation - but they'll always say goodbye, and will be very astonished if you don't. And yes, more than a few will take up to 10 minutes to say their goodbyes to a friend or relative - my mother & sister do that. Written conversations, including e-mail (! ), are always ended with the one or other closing formula - the most common formal sign-off is "Mit freundlichen Grüssen" ('with friendly greetings' - roughly 'kindest regards'), which is sometimes abbreviated to "mfg" in certain settings. Yes, people will use standard greeting and closing formulae even in conversations via email. It's just customary. You may omit them if the conversation then expands into a rapid-fire thread of mails, but it's highly recommended to use proper greetings and closing formulae at least in the initial mail. And there's no Germany equivalent to the phrase "To whom it may concern" - I've had serious difficulties using that one in a mail or letter, even after assurances that this wasn't rude at all, as it feels so weird to me. It feels like I'm saying that I don't care how the recipient takes my message, like I'm saying "Use the following as toilet paper if you can be bothered". The common headers are "Sehr geehrter Herr/Frau [Surname]" ('Very honoured Sir/Lady [Surname]') if the name and gender of the recipient are known, or "Sehr geehrte Damen und Herren" ("Very honoured Ladies and Gentlemen") otherwise. But you will say 'Excuse me, could you tell me where I can find the chips?' rather than just saying 'Chips?' or something? Same in Germany; but you do acknowledge talking to a human being - by using some kind of greeting formula or other? "To whom it may concern" is one of the weirdest things for me to use. I mean, how hard can it be, especially for applications. Over here, at least somewhere in the body, the job ad says something like "please direct your application towards [XY]". Or is that a US sieving mechanism? "To whom it may concern" doesn't register as rude for me, but it does kinda sound like you're crashed on a desert island and are putting a letter in a bottle. Well ... it depends with the 'Joker-i-ness': Obama looks like 'An American being American' (still a lot of teeth by German standards, but 'different strokes ...'), while Ms. Witherspoon appears as if she's failing to hide the fact she's in excruciating pain. 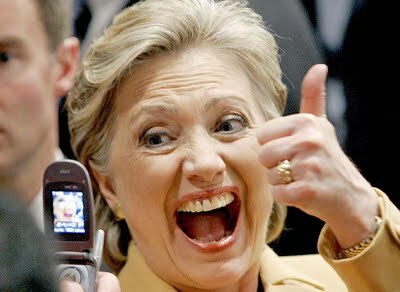 And Ms. Clinton looks like she's had rather a lot of some really good stuff. People in the US waste a *lot* of money on cosmetic dentistry. Of course they want to show it off. Spoken as a USian who still has crooked teeth. In that way, I guess you could say I've integrated. After over a decade of living in Germany, I now lack "Begeisterungsfähigkeit" — the ability to get excited, as the Germany-based American writer John Doyle calls it in his book, Don't Worry, Be German. Why don't Germans smile more? Yes, a whole nation afflicted by bitchy-restface-syndrome. When studying French in high-school, I was taught that in France it is rude to just walk into a shop and ask for what you want, and that one should first greet the person behind the counter, or respond to their greeting if they got in first. However, I have never actually visited France, so I have no idea how far this is true "on the ground", as it were. Not so much in large department stores, but in small stores such as boulangeries and patisseries, it certainly is true, or at least has been when I've been there. It's pretty outmoded now. It's better now to address the letter as specifically as possible. If you can't find out who to address your letter to, go with "Dear hiring manager" or something. Formal settings - and written conversation count as highly formal, as they cannot transport gesture & mimics - require more adherence to proper protocol, not less. As I said above, I vividly remember the first exchange that omitted the greetings & goodbyes years after the fact, and wondering what I'd done to offend the offender.